Reeled or filament silk is the highest quality thread and is very shiny. Reeling is the process of unwinding the mile long filament spun by the silkworm to form its metamorphosis chamber, a cocoon. Silk is comprised of two proteins: fibroin, the thread and sericin, the gum or glue. Cocoons are soaked in warm water to soften the gummy sericin. The silken strand from a single cocoon is too fine to use alone. Individual filaments of 6–40 cocoons are unraveled together, traveling through a very small eye as the thread is wound onto a reel. During this process, the softened sericin dries, hardens and binds the strands together as one thread, the size of a human hair. The silk remaining from the reeling process and the damaged or imperfectly shaped cocoons become the raw material for the lustrous, creamy colored spun silk thread. All this material must have the sericin removed (degummed) with soap and water. Once dried, the silk is carded and combed, laying the fibres parallel, ready to be spun into thread. All of our spun threads are gassed. This is a finishing process of running the spun yearn through a series of spikes which creates static. This pulls any loose fibres or debris to the surface. The thread continues through a hot flame at a very high speed to singe off the fluff produced during the spinning process, which helps prevent pilling. Silk threads and ribbons are exceptional for embroidery and needle arts- silk’s luster is unsurpassed! For the hours you spend creating your heirlooms, you owe it to yourself to use high-quality silk. Most of our silks come from China in natural color. Our dyers, in Colorado, or B.C. Canada, work magic in their cauldrons to produce 100 plus luscious solid colors and 74 dazzling variegated colorways (Montano Series). Treenway offers four types of threads wound into 10 yard skeins for embroiderers, quilters, mixed media artists and embellishers of all types. Need help ordering Mini Skein Threads? Treenway's Carmelina (100% Muga Spun Silk Yarn - 30/2) is suitable for some needle work. The thread is handmade so expect those wonderful irregularities of such a yarn. Muga caterpillars live primarily in the Brahamaputra River valley in Assam, India, and sparsely in other north–eastern states of India. The silk released from these cocoons is shimmery and golden. Treenway's Kinetta (100% Tussah Peduncle Spun Silk Yarn- 30/2) is suitable for some needle work. It has a natural golden color and less shine than Bombyx threads. All of Treenway Silk's ribbons are woven using fine reeled silk which still has the sericin in it. This acts as a natural sizing. The warp threads are two strands of fine silk which are twisted together. There are 300 fine warp threads per inch. The weft is a single silk strand. The ribbon is woven in plain weave, where the weft goes over one warp thread and under one warp thread all the way across. The loom is set up to maximize efficiency in weaving the narrow ribbon bands. Three layers of ribbons are woven at once. Approximately 14 ribbons are woven simultaneously across the loom with another layer of 14 ribbons above that and another 14 above that. There are 42 tiny shuttles and bobbins carrying the weft back and forth at one time. Observing the winding of all those thousands of fine threads into numerous layers and sections onto the loom, was akin to watching an orchestra of spiders building a massive web. Treenway offers 4 sizes of 100% Bombyx woven silk ribbon. Large, Full Skeins: For Treenway's best value in silk ribbon we offer large skeins of woven silk ribbon in natural white. You may order dyeing in any of our 100 plus colors. Mini Skeins - 5yd: We've got your color! Treenway offers our exceptional 100% Bombyx Woven Silk Ribbon Mini Skeins in all our 100+ colors. Need help ordering Mini Skein Ribbons? May be dyed to order from Treenways 100 plus colors. Available in natural and a limited selection of solid colors. We have worked with our stitching threads and ribbon on a variety of canvas and linen with our consultant Diana Caleb. The following information is the result of our work and a starting point for your projects. One should make a test sample to ensure the finished piece will look as intended. Open the skein and cut the threads at both ends — it makes a perfect stitching length of 18". You can keep the threads tidy by loosely knotting them. Fine Cord Reeled Silk(Buttonhole Twist) is tightly spun and twists as you work with it. Hold your work up often and let the thread dangle and untwist itself. Paint canvas with silk paints — paint must not clog holes. Diluted acrylic paints may also be used but care must be taken not to clog holes. Iron after paint has dried. 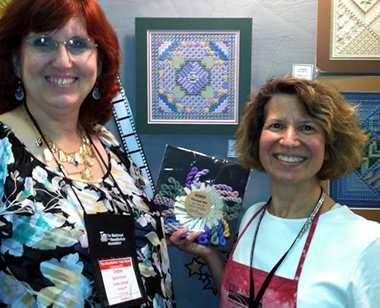 Treenway Silks Now Offers DebBee's Designs Thread Kits! We’re so excited that esteemed canvas work designer Debbie Rowley (DebBee’s Designs) selected Treenway Silks’ threads to use in her newest two designs! 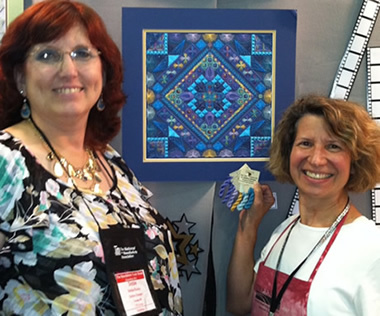 Both were debuted at 2013 TNNA-Columbus and they have been huge sellers! Garden of Silken Delights has been designed totally with Treenway Silks’ threads. And we have put together a thread kit for you here. Using just one brand of silk in her design is a departure for Debbie, but she was so excited about our silks that she was inspired design this piece completely with our extensive threads collection. Tropical Punch is Debbie’s other new pattern. This design features 6 different Treenway Silks threads/colors. Here’s the Treenway Silks’ Thread Kit. Recently I found a “new” thread line, one that has actually been in business for more than 30 years, Treenway Silks. 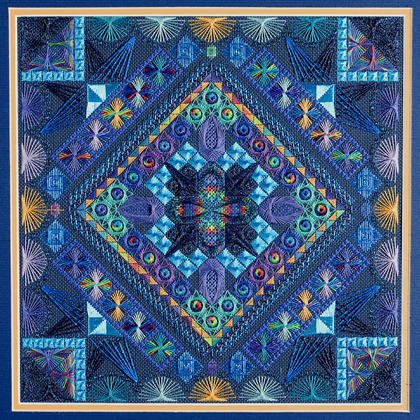 I had first heard of Treenway Silks when a stitcher had used them for a different colorway for Diamond Delight 4, and her rendition won a prize at the prestigious Woodlawn competition. I was quite intrigued, but couldn’t find out much about the silks since I hadn’t physically seen them, and didn’t know of a shop that carried them. Then at the Winter TNNA show in Long Beach, Treenway Silks had a booth and I made the connection finally. Beautiful silks in three weights, plus silk floss! Overdyeds and solids, plus ribbons! I couldn’t wait to stitch with them myself. So I arranged with the owner, Susan DuBois, to stitch a project entirely with Treenway Silks, and then another project that incorporated Treenway Silks with other threads. Garden of Silken Delights is stitched entirely with Treenway Silks in 3 weights. Zen Shin is probably my favorite weight, equivalent to about a #5 pearl. It’s 20/2 spun silk, beautiful hand and yummy colors plus overdyed colors. Tranquility is a fine silk cord, equivalent to a buttonhole twist, overdyed or solid colors. And Serenity is the heaviest weight, 8/2 reeled silk, about a #3 pearl equivalent. The Zen Shin and Serenity can be plied or stitched with as is. Treenway Silks has a thread pack for Garden of Silken Delights, and I also have it for my retailers, all the threads needed for the whole project. For the project that combines Treenway Silks with other threads, I designed Tropical Punch. I loved this project! I had so much fun with this one, and put in my favorite stitches – double fan doubled, Amadeus, crescents, waffle stitches. I also used some of my favorite threads as well, from Caron Collection, Kreinik, Rainbow Gallery and Presencia in addition to the Treenway Silks. I hope you enjoy it as much as I did! I may revisit the topic of thread selection at another time, but I think I’ve exhausted it for now! As always, if you have any questions about my thread or stitch or color selection, just let me know and I’ll answer as best as I can. 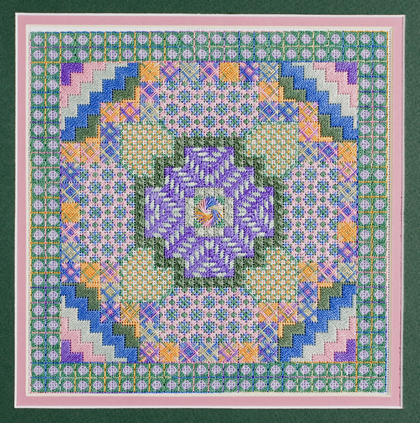 Sheila writes to us about her very special shawl: "My Memory Crazy Quilt Shawl". This was made from my mother's fabrics which included hand-dyed laces embellished with her pearls. To this I added special buttons given to me by friends who wished to be remembered and included. I used beautiful silk ribbons from Treenway and Brazilian Embroidery to highlight the shawl. It took six years to make and is made it to be worn and I wear it frequently. It draws many compliments but, more importantly, it reminds me of my dear mother and of the many friends who gifted me precious mementos for my shawl.